Long is the history of old people attributing their longevity to their vices: whether it's a 116-year old woman eating bacon every day, a 110-year-old drinking three Miller High Lifes a day, or a 109-year-old drinking whiskey every night. But these old folks all have something in common: they're women, and they do things in moderation. Not so, for Antonio Docampo García. Aside from being a man -- a rarity among the vice-loving elders -- Docampo also drank more than most. In fact, he drank four bottles of wine every day. 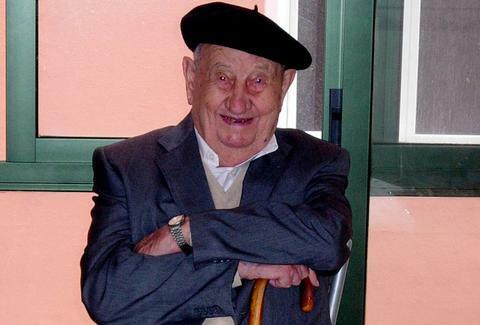 According to La Voz de Galicia, Docampo passed away in January at the age of 107 in the city of Vigo, Spain, where he was living with his son. But what makes his story so interesting, of course, is his daily drinking habit. Manuel Docampo López, his son, said "When we were at home, between the two of us, we could drink more than 200 liters of wine a month. And he never drank water." Manuel says even at age 60, his father drank two bottles of wine with lunch, and two with dinner. But the secret elixir wasn't just any wine -- Docampo drank wine he produced in the region of Ribadavia, described as "natural, without preservatives, sulfites or other added chemicals." Along with the healthy wine habit (as in extensive), Docampo also drank a shot of liquor in the morning with breakfast. He fought in the Spanish Civil War, and didn't take any antibiotics until he caught pneumonia at the age of 103. The following year, he came down with pneumonia again and nearly died, only for nurses to discover he hadn't been taking the pills prescribed to him. His son subsequently took him home and crushed up the medication in Docampo's food, and he later returned to health, described as a "phenomenon" until he hit 105. Docampo had four children, two of whom survive him, along with seven grandchildren, ten great-grandchildren, and one great-great-grandson. As the Spanish would say, "¡Salud!" Antonio Docampo García. Ryan Craggs is Thrillist's Senior News Editor. He lived in Spain for about a year and a half. He believes magic like this makes it the best place on Earth. Follow him @ryanrcraggs.